Inuit art from the Arctic regions of Canada, encompassing Nunavut and the Northwest Territories. 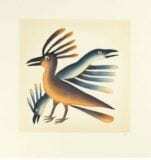 We feature sculptures, prints, and wall hangings from Cape Dorset, Kimmirut, Iqaluit, Sanikiluaq, Baker Lake, and more. At Home & Away, we believe in exceeding your expectations and building long-term customer relationships.We share our customers’ passion for Inuit art from the Arctic regions of Canada, including sculptures, limited edition prints, wall hangings, and a dash of jewelry. The Inuit peoples have been decorating items for millenia. Until modern times, the nomadic people concentrated on small items, including utilitarian toggles, masks, and carvings of animals. In pre-contact times, walrus tusk and caribou antler were most commonly used. They had no word for art, but rather focused on how well they thought something was made. Around 1948, a young artist from southern Canada began to encourage Inuit people to carve in stone. Houston introduced the sculptures to the metropolitan areas of Canada, followed by the United States and Europe. The work continues to enjoy a reputation around the world as an indigenous form of art that remains true to its roots. 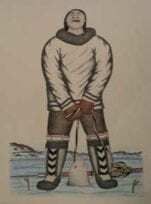 With the opening of Kinngait Studios in 1959, production of limited edition prints began in what most non-Inuit call Cape Dorset, in the Inuit-governed territory of Nunavut. The annual release of prints from Cape Dorset continues nearly sixty years since it began. Wall hangings are created in several communities in Nunavut, with Baker Lake being the most well-known. Before contact with Europeans, Inuit women created practically all their clothing from animal materials, including skins and gut. These utilitarian items were often decorated by overlaying or underlaying skins of different colors and textures on the base skin. Since the advent of wool fabrics, the women have converted much of their artwork to appliqué and embroidery. Images on wall hangings reflect either every day life, legends, or shamanic figures. Where you can find Inuit Art? Home & Away Gallery has been delivering high quality Inuit art to buyers around the world since the year 2000. Some customers make purchases for their personal collections, while others purchase items as gifts. Either way, we are glad to consult with you on your interests, and to help you find the right item for your needs: something that will make you or a gift recipient happy to be living with your acquisition.